The CEO and a number of delegates have attended UN conferences, forums, working groups and seminars under the AFRE umbrella. Some delegates began to lobby at conferences in the early 1990s. Others have presented written statements or have attended conferences to observe, but have not spoken. Below is an abbreviated list indicating only the conferences at which delegates have spoken since 1998. Alia Mansoor has served as website creator, designer and webmaster for AFRE since 1997. 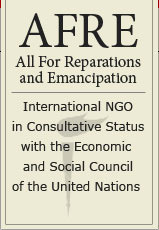 Hasan Shaheed provided artwork and professional design services for AFRE.